don’t get any work, I don’t get anything. be in the interests of the taxpayer”. can see through it no matter how many times you try and brand some people. like I’m going to be one of those who will not be able to remain in my home. is not a fire hazard. Yes, the apartment is definitely 100% structurally sound. Yet, I cannot remain in my home? When did people become expendable Michael? individual then you have failed every single individual. totally straight with you, I expect the very same back and nothing less. Who do you work for Michael? am doing just that. I demand answers and am holding you to account. will forward this letter to as many media outlets as possible. poison. The EMU is based on a common central bank and a common fiat currency. can be no central planning by Keynesian means. the current problems are temporary. After 3 years of Austerity and the forcing of German bank debts on to the shoulders of the Irish nation, we are at last beginning to see the whole scam come apart. The treachery of Brian Cowen and Brian lenihan on that night of shame when they both agreed to bailout the corrupt banks by placing the entire bank gambling debts on the Irish citizens in order to protect the solvency of the Deutsche bank is now coming out into the open . Indeed I would argue that Ireland should be given back all the billions we have already paid to the bondholders of this odious debt.I say again, I do not recognise the right of the Irish government to impose on me and my family this odious debt .I maintain this action to force the private debts of corrupt banks on to the heads of the ordinary citizens of Ireland to be unconstitutional and the people responsible should be brought before the courts on charges of fraud and treason! The State does not have the right to inflict massive debts on to its citizens.Suearly the citizens have a right to be consulted in such an issue ? Top civil servant received a pension package worth over €700,000. THE COUNTRY’S former top civil servant Dermot McCarthy received a combined retirement and pension package worth over €700,000 after stepping down this summer. Mr McCarthy, secretary general to the Government, retired in July after 11 years in the position. He was also secretary general to the Department of An Taoiseach. As the taoiseach’s chief adviser, he was entitled to attend all Cabinet meetings. During his tenure of more than a decade, Mr McCarthy was most associated with the social partnership process. He was secretary general to three taoisigh: Bertie Ahern; Brian Cowen and, in recent months, Enda Kenny. 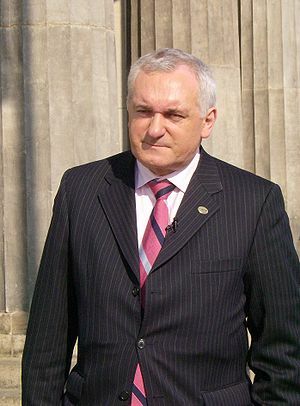 He was the taoiseach’s main adviser during the Northern peace process. He was also in position when the banking sector collapsed; when the economy was thrown into recession and when the previous government was forced to rely on intervention from the EU and IMF. In addition to his annual pension of €142,670, Mr McCarthy was also paid a once-off lump sum of €428,011. He was also entitled to another special severance payment of €142,670. The overall package was worth €713,000. Details of Mr McCarthy’s package were released to RTÉ under the Freedom of Information Act. On retirement, all public servants are entitled to a lump sum, worth 1.5 times the final salary. The sum is untaxed for all but the highest earners and has become increasingly contentious in recent years. While Mr McCarthy’s annual salary had fallen from €285,000 to €208,000 as a result of a series of pay cuts affecting high-earning public servants and ministers, his final salary for pension purposes remained the original figure of €285,000, leaving him with the lump sum of €428,000. He will pay no tax on the first €200,000 of the €428,000 but following changes in this year’s Finance Act will pay tax of 20 per cent (or €45,600) on the remaining €228,000. The net worth of the lump sum is €382,400. A Government spokeswoman said it was committed to ending the “exceptionally generous pension regime” for those at the top of the public and private sectors. this kind of outright blatant abuse of public moneys be plundered and given to the chosen few who are not accountable to anybody ,who seem to be entitled to such vast sums of our money. are getting ) The private sector has had to cut their cloth but the politicians chose to ignore this reality and instead choose to take from the already poor, unemployed and cut hospital services instead ,but this action will not save the country it has only extended the pain as we continue to create more and more debt trying to ignore this elephant in the room . will we wake up in this country and rid ourselves of these leaches ???? Bertie at Galway races, Cowen pissed, Yank in Dublin! THE NEW GOVERNMENT has decided to cut back on ministerial transport arrangements, with all but three members of the cabinet being forced to supply their own cars from May. This morning’s cabinet meeting decided that only the Taoiseach, Tánaiste and Minister for Justice and Equality would still be given a State-supplied car with a full-time Garda driver – with all other members of the government having to stump up for their own cars in future. Other ministers would still be given drivers, under the new regime that takes effect on May 1, but the car will have to be supplied by the minister themselves – in line with the arrangements already in effect for junior ministers. Former Taoisigh – including Bertie Ahern and Brian Cowen – and former Presidents will also lose their automatic right to an official state-supplied car and a Garda driver, except when they are required in line with important State occasions. The President, Chief Justice and Director of Public Prosecutions are the only other people who retain a State car with a full-time Garda at the wheel. In a statement, a government spokesman said that those three, as well as the three exempted ministers – currently Enda Kenny, Eamon Gilmore, and Alan Shatter – required the use of a Garda driver for security reasons. The new moves will produce “very substantial savings”, the statement added, explaining that Ceann Comhairle Seán Barrett and attorney general Máire Whelan will also lose their full-time drivers and state-supplied cars, and will have to produce their own vehicles in future. In the case of the former Taoisigh and of former president Mary Robinson, the new transport arrangements come into effect in three months’ time. The cabinet also decided to cut the maximum permitted number of staff in the private and constituency offices of ministers and junior ministers. Ministers will now have a maximum of eight staff in their private offices, and four in their constituency offices – reduced from ten and six respectively. Junior ministers will see the same staffing numbers cut from seven and five respectively, to five and three respectively. Why stop there what about the enormous salaries of the rest of the TD’s X civil servants and perks like free car parking in the grounds of Leister House. It would be better for the controller and Auditor General to first publish a list of exactly what the perks and wage top up’s public representatives get! .We the public don’t really have a clue as to how well X public representatives are looked after ! The Irish electorate destroyed the incumbent party only months after the humiliating €85 billion (about £72bn) bail-out from the IMF and EU. Exit polls suggest opposition party Fine Gael have won 36% of first-preference votes, just short of the majority needed to form a single-party government. The polls indicate Fine Gael won 72 seats, while Fianna Fáil managed only 20, fewer than the resurgent Labour Party’s 38. Fine Gael is now expected to seek the backing of independents or Labour to form a coalition. Fianna Fáil is estimated to have only 8% support in Dublin and may have failed to win a single seat in the capital. Taoiseach-in-waiting Enda Kenny said the humbled Fianna Fáil party had lost touch with the Irish people. Senior figures in the centre-right party were bullish about their prospects and suggested a coalition government was far from inevitable. According to an early count, Sinn Fein president Gerry Adams won in Louth after giving up his Westminster seat north of the border to run in the Republic of Ireland’s election. He said: “If Enda becomes Taoiseach, I wish him well. “We will support him when he is doing things that we think are good and progressive, and we will oppose him tooth and nail when he is doing things that are not in the common good.”Conor Lenihan, a Fianna Fáil candidate who stood in Dublin South-West, was one of the first to admit defeat.“Clearly the tide was out for Fianna Fáil in Dublin,” he said.Pat Carey, outgoing Gaeltacht Minister, said: “There’s no shame in losing – the shame will be if we didn’t learn from it.”Fine Gael promised “Smaller, Better Government” during their campaign, promising to reduce the deficit by cutting waste rather than hiking up income tax. Fianna Fáil has governed for 60 of the past 80 years and guided the country towards its Celtic Tiger economic successes. It has since been blamed for the subsequent recession which has gripped Ireland for three years. Fine Gael promised “Smaller, Better Government” during their campaign, promising to reduce the deficit by cutting waste rather than hiking up income tax. Well we will see, I expect an emergency Budget and tax hikes and wholesale selling off of state assets, further job losses and further cuts in health services and introduction of water charges, family home taxes, closing down of some of the Banks and job losses there too for starters and an increase in emigration. All this will be for nothing as I still expect us to default anyway. I will be betting that the government will last only tops 24 months any takers?